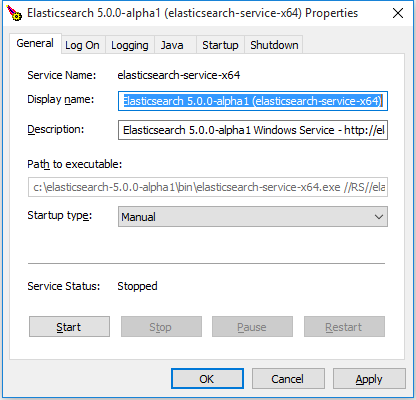 Elasticsearch can be installed on Windows using the .zip package. This comes with a elasticsearch-service.bat command which will setup Elasticsearch to run as a service. Elasticsearch has historically been installed on Windows using the .zip archive. An MSI installer package is available that provides the easiest getting started experience for Windows. You can continue using the .zip approach if you prefer. This package is free to use under the Elastic license. It contains open source and free commercial features and access to paid commercial features. Start a 30-day trial to try out all of the paid commercial features. See the Subscriptions page for information about Elastic license levels. By default, Elasticsearch runs in the foreground, prints its logs to STDOUT, and can be stopped by pressing Ctrl-C.
Elasticsearch loads its configuration from the %ES_HOME%\config\elasticsearch.yml file by default. The format of this config file is explained in Configuring Elasticsearch. Values that contain spaces must be surrounded with quotes. For instance -Epath.logs="C:\My Logs\logs". Typically, any cluster-wide settings (like cluster.name) should be added to the elasticsearch.yml config file, while any node-specific settings such as node.name could be specified on the command line. Elasticsearch can be installed as a service to run in the background or start automatically at boot time without any user interaction. This can be achieved through the elasticsearch-service.bat script in the bin\ folder which allows one to install, remove, manage or configure the service and potentially start and stop the service, all from the command-line. While a JRE can be used for the Elasticsearch service, due to its use of a client VM (as opposed to a server JVM which offers better performance for long-running applications) its usage is discouraged and a warning will be issued. The system environment variable JAVA_HOME should be set to the path to the JDK installation that you want the service to use. If you upgrade the JDK, you are not required to the reinstall the service but you must set the value of the system environment variable JAVA_HOME to the path to the new JDK installation. However, upgrading across JVM types (e.g. JRE versus SE) is not supported, and does require the service to be reinstalled. The Elasticsearch service can be configured prior to installation by setting the following environment variables (either using the set command from the command line, or through the System Properties->Environment Variables GUI). A unique identifier for the service. Useful if installing multiple instances on the same machine. Defaults to elasticsearch-service-x64. The user to run as, defaults to the local system account. The password for the user specified in %SERVICE_USERNAME%. The name of the service. Defaults to Elasticsearch <version> %SERVICE_ID%. The description of the service. Defaults to Elasticsearch <version> Windows Service - https://elastic.co. The installation directory of the desired JVM to run the service under. Service log directory, defaults to %ES_HOME%\logs. Note that this does not control the path for the Elasticsearch logs; the path for these is set via the setting path.logs in the elasticsearch.yml configuration file, or on the command line. Configuration file directory (which needs to include elasticsearch.yml, jvm.options, and log4j2.properties files), defaults to %ES_HOME%\config. Startup mode for the service. Can be either auto or manual (default). The timeout in seconds that procrun waits for service to exit gracefully. Defaults to 0. At its core, elasticsearch-service.bat relies on Apache Commons Daemon project to install the service. Environment variables set prior to the service installation are copied and will be used during the service lifecycle. This means any changes made to them after the installation will not be picked up unless the service is reinstalled. On Windows, the heap size can be configured as for any other Elasticsearch installation when running Elasticsearch from the command line, or when installing Elasticsearch as a service for the first time. To adjust the heap size for an already installed service, use the service manager: bin\elasticsearch-service.bat manager. The service automatically configures a private temporary directory for use by Elasticsearch when it is running. This private temporary directory is configured as a sub-directory of the private temporary directory for the user running the installation. If the service will run under a different user, you can configure the location of the temporary directory that the service should use by setting the environment variable ES_TMPDIR to the preferred location before you execute the service installation. Most changes (like JVM settings) made through the manager GUI will require a restart of the service in order to take affect. The .zip package is entirely self-contained. All files and directories are, by default, contained within %ES_HOME% — the directory created when unpacking the archive. This is very convenient because you don’t have to create any directories to start using Elasticsearch, and uninstalling Elasticsearch is as easy as removing the %ES_HOME% directory. However, it is advisable to change the default locations of the config directory, the data directory, and the logs directory so that you do not delete important data later on.